Defence for Children International (DCI) is an independent non-governmental organisation that has been promoting and protecting children’s rights on a global, regional, national and local level for 30 years. DCI is represented through its national sections and associated members in 46* countries worldwide. Its International Secretariat is based in Geneva, Switzerland. The DCI movement was founded in 1979, the International Year of the Child, at a time when few international structures were dedicated to a rights-based approach in addressing the many challenges facing the world’s children. DCI was at the forefront in the drafting process and international lobby for the adoption of the UN Convention on the Rights of the Child, and its work continues to be embedded in these fundamental principles. 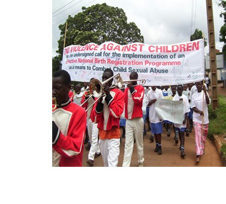 This year in 2009, DCI celebrates its 30th anniversary: a birthday it shares with the 20th anniversary of the Convention on the Rights of the Child. This highlights DCI’s historical role as a leading advocate for the adoption of the Convention and one of the first organisations to work from the concept of children’s human rights. At the global level, the DCI movement is united in its commitment to working for children’s rights in juvenile justice. DCI works to protect, defend and advocate for the rights of children and young people in conflict with the law. DCI provides direct assistance and support to children in need. Many DCI national sections run socio-legal defence centres which represent children in conflict with the law and take on cases where children are being imprisoned without cause. Other DCI sections provide support and rehabilitation services to child workers and victims of trafficking. DCI advocates at national and international level for the development of policies and practices which are in the best interests of the child. This involves lobbying States to adopt national policies which reflect the UN Convention on the Rights of the Child and urging the Human Rights Council and other UN bodies to take action against gross violations of children’s rights. DCI researches and monitors the practical application of children’s rights according to international standards and reports on abuses and violations. DCI also researches pressing concerns in children’s rights, offering recommendations and mobilising resources for further action. DCI provides training to members of the community on the UN Convention on the Rights of the child, including strategies for promoting children’s human rights. DCI also works with police officers, judges and other professionals to train them in guaranteeing the rights of children in juvenile justice systems. In the area of child labour, some DCI national sections train employers and teachers on methods for ensuring that child workers have access to a quality education.